If you’ve grown daffodils in pots, perhaps on a patio or even to bunch them in a decorative bed, then don”t waste them at the end of the year. Planting the daffodil bulbs out into a lawn or border will give you many more years of pleasure. 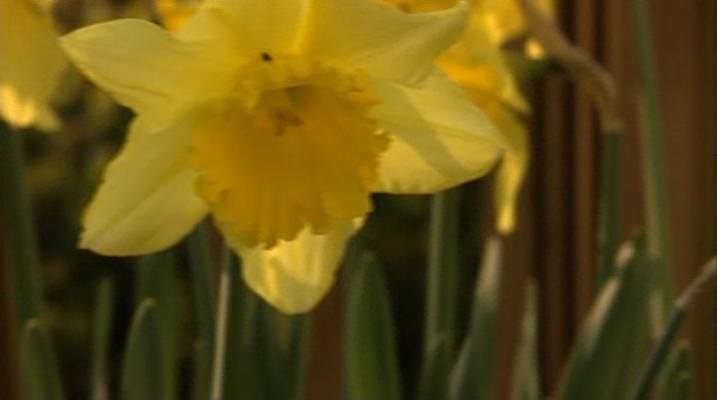 In this video, Sam Youd, head gardener at the world famous Tatton Park Gardens shows us exactly when and how to take the daffodil bulbs from the pot and how to plant them. Note his comment at the end about scattering them on the ground and planting where they land for a natural look. Also note the depth they should be planted out at: about a spade’s depth. What he doesn’t mention is that for a good show you need to feed the plants in spring and summer so that they rebuild their food stocks in the bulb. If you don’t help them to do this or hinder them by cutting the foliage down early, they will eventually cease to flower altogether before dying off. Daffodils are such an under rated flower – they’re bright and full of life when little else is showing in the garden in early spring. Here in North Wales daffodils brighten so many of the road verges until the bluebells take over. I am planning to transplant some daffodils from pots to the garden and it says above that I should feed my daffodil plants in spring and summer so that they rebuild their food stocks in the bulb. What type of feed should I use please? Just use a general purpose fertiliser like growmore or fish, blood & bone – a handful per square yard at most. Add some extra bonemeal (1 bonemeal to 3 general fertiliser) if you have it available. Don’t tie up the leaves or cut them – let them go down naturally. If you’re planting into a lawn, feed the lawn as normal and feed the daffs on top of that. Thanks John, for your quick and helpful reply. I will take this on board when I do the transplanting. I already have all the feed you mentioned.